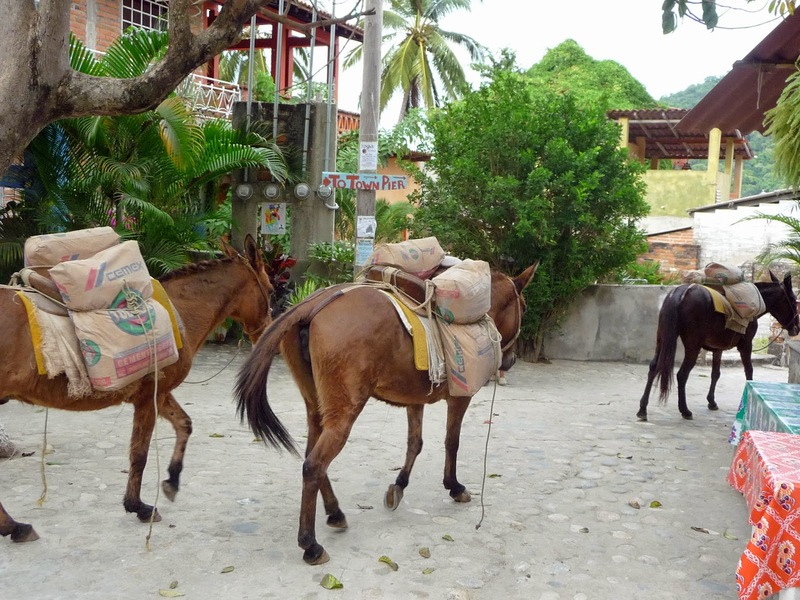 Grobetrotting With Jeff: Back in Yelapa Again! I’d arranged room and board with a lady named Irma who had several rental units near the school. My teacher, due to a missing cat, was not in town and would not show up for several days – so I was on my own. The first thing that became apparent to me was that few people here spoke English and I had no working knowledge of Spanish. Not an ideal situation. I decided to give it a few days to see if things would improve before I called it a day and headed back to Puerto Vallarta and civilization. I’m glad I did. I muddled through, my teacher eventually showed up, and I fell in love with Yelapa. It’s small and nearly everybody says “Olla” as you walk by. The town is essentially split into two parts divided by a river. On one side is the beach which is where the day tourists from Puerto Vallarta are deposited. On the other side of the river is the town itself which is populated by locals and expats. It’s an affluent little town – by Mexican standards - only one beggar – and she winters in Vegas. liked it so much he returned six months later with six of his friends! Last year, my wife, tired of hearing our friends raving about the place decided to give it a try for a couple of weeks. 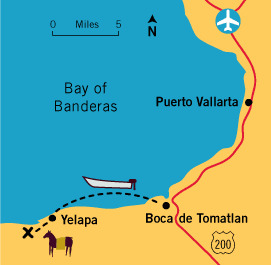 I was surprised, because I didn’t think Yelapa would be her cup of tea. I made a deal with her: if she didn’t like it I’d put her on the plane back home. I figured she’d last four days – tops. I was wrong about that, because after four days she informed me she wanted to return next year – for two months! The remainder of our time was spent searching for suitable long term accommodation for the next year. We must have looked at twenty or more units – none of them acceptable. What she wanted was a home – not a short term vacation rental. We were on the verge of giving up when I ran into the lady I’d boarded with on my first trip to Yelapa. She asked if we’d found anything suitable yet. I told her no, and told her what we were looking for and she told me to get my wife and come back. The asking price was so reasonable – I had to ask twice. But there was a catch: we had to commit to three months not two. But as Michele pointed out the rent for three months was less than others were asking for two months and their units weren't as nice. Even if we only stayed for two months and left – we would still be ahead of the game. Since the house was nearing completion I made some suggestions that would make the house more attractive to us and they were readily agreed to. With the extra bedroom we hoped that family and friends would join us from time to time. My buddy, Dave, was first to sign on: he would come down first with me to check out the place and make sure everything was in order. In two weeks Michele would follow, and hopefully all the problems – or most of them would be worked out. When Dave and I arrived at the casa the gardener was still working on the garden. He told us electricity had been hooked up only a week previously, and the internet connected up a couple of days after. There were a few immediate problems - which was to be expected since we were the first occupants. The biggest problem was very little water pressure. Water just dribbled out of the taps. A little investigation determined that the screens in the taps were totally plugged with sand – probably because the pipes weren’t flushed after they were installed. A bit of work improved the water pressure significantly – although it wasn't up to N.A. standards. There was adequate furniture inside the casa but there wasn't a single piece of furniture on the patio. An appeal to the owner resulted in a very nice patio set arriving from Home Depot in Puerto Vallarta. Our patio with "jungle view"
Despite solving the immediate problems it became apparent Dave wasn't happy up here. 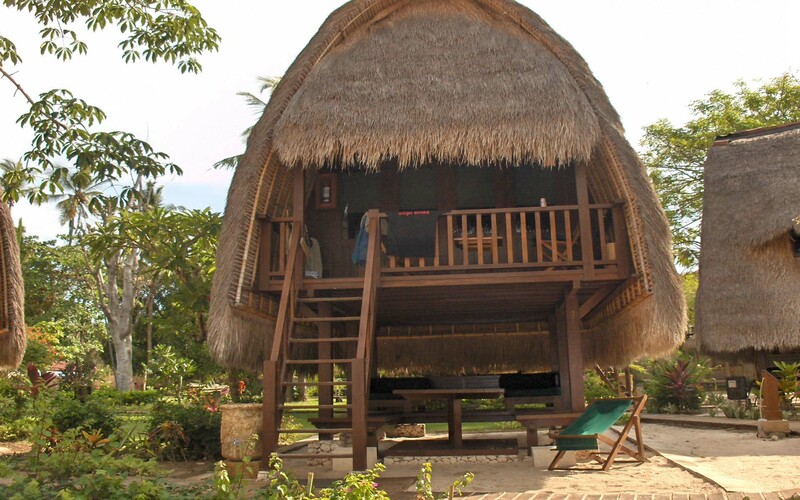 We had a great “jungle” view – complete with tropical birds and animals, but we currently lacked a view of the harbour. In previous years Dave would spend countless hours perched on the deck, beer in hand, commenting on the comings and goings in the harbour. There was also the added inconvenience that the new casa was perched up on the hill side and Dave found it a bit of strain tackling the stairs two or three times a day. A call to my previous landlord revealed he had several condos available right on the water. Since it was still off season I negotiated an attractive rental rate for Dave and he immediately moved to his new waterfront view casa – about 3 minutes away. A week after we arrived, Curt and Connie, neighbours from Gambier, arrived. As mentioned previously, Curt had visited me in Yelapa before but this would be Connie’s first time and we were unsure whether or not it would be her cup of tea. Connie seemed to enjoy the town; spending her time hiking, taking Yoga lessons, having massages, and chilling out daily on the beach. Curt spent most of his time on the beach, relaxing, and following his stock portfolio on the internet. About four years ago there were only two people in Yelapa who had internet. Very few had cell phones since the closest tower was across the bay in Puerto Vallarta and you had to stand in the exact spot high on a hill, balance on one foot and hope the wind was blowing the right way. In just a few years things have drastically changed: now everybody has internet – and I mean everybody! Even the places on the beach provide it – free. A day or so after Curt and Connie arrived we went fishing with Luis. Luis is a local charter fishing guy – and we’d been fishing with him previous years – always with spectacular results. This time was no exception. Rather than write about it, you can watch a great two minute YouTube video of our day’s fishing adventure. We caught so many Mahi Mahi, that after I kept about ten pound in the freezer to see us through the next couple of months we were still able to give a lot of it away to two of our favourite restaurants. I hope to go fishing again in early January when there might be more room in the freezer. The first two weeks passed quickly and I was off to Puerto Vallarta and the airport to meet Michele. I’d done an inventory of the place and she packed a second suitcase of stuff to make up the deficiencies – particularly baking and cooking items she wasn't sure she could source in Yelapa or Puerto Vallarta. There are about a half dozen “tiendas” spread around the Yelapa. These are small corner grocery stores that have a wide range of items, but you can’t always count on them having “exactly” what you need. But between all of them you can generally make do. 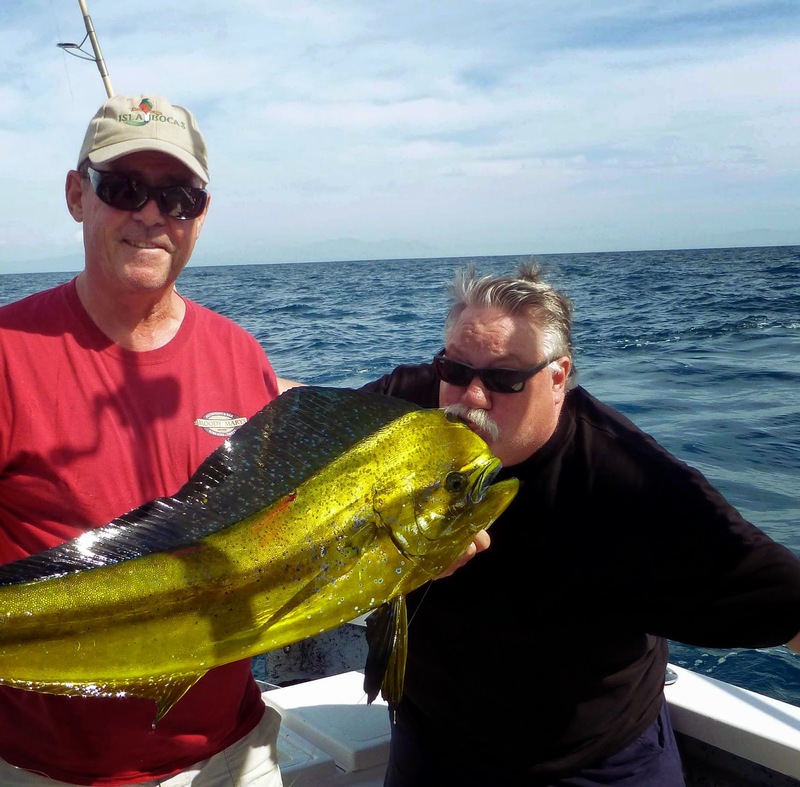 For special items you need to take the boat to Puerto Vallarta where there’s a Wal-Mart, Costco and several mega grocery stores as well as open air markets. One thing we've noticed is the days go by fast, but the weeks seem to fly by. We’re already nearing the two-third mark and it seems I just arrived. Today a guy with a machete and voila - we have an ocean view! Friends from Gambier are due to arrive right after New Years. My sister-in-law is planning to spend a few days with us in early February and we’re hopeful my son, daughter-in-law and their baby will join us around the same time.